Strut records continue their acclaimed South African series with Next Stop Soweto Volume 4, a compilation of recordings from 1975 to 1985. Life was tough for these musicians. The apartheid regime was in its prime, and black artists had few outlets. The Radio Bantu group of stations gave a rare platform, but even its efforts could not provide full time jobs. In 1976 the Soweto uprising, a protested against the government's enforcement of Afrikaans as the primary language in local schools, brought worldwide criticism and a heavier boycott on South Africa. The country was a regular focus of international attention, but the boycott pushed its fertile musical talent into further isolation. It was only when a Ladysmith Black Mambazo cassette found its way into Paul Simon's car in the early 80s that a chink of light broke through. The swelling voices of the male vocal group slowly grew on Simon, who was emotionally shattered after his divorce from Carrie Fisher and a serious career slump. Forgetting how he'd acquired the tape, Simon used the expertise of Warner Brothers to trace the sounds to South Africa, and his Grammy Award winning Graceland album was born. 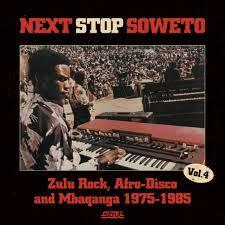 Every artist on Next Stop Soweto Volume 4 would have been at the centre of Graceland if they'd been on that cassette. Ladysmith Black Mambazo did a faultless job, but the lottery of their big break is testament to how enigmatic South African music was at the time. If Paul Simon could've tuned into a Radio Bantu station on his early morning drives perhaps Elias Maluleke and Mavambe Girls, whose irresistible funk/disco groove whips their 'Khombo Ranga' track into a gumboot-stomping frenzy, would've re-written ‘You Can Call Me Al'. In line with South Africa's demographics, there's an immense diversity on Volume 4. American funk and soul influences are boiled up with South Africa's confident homegrown jazz movement, and the more intrepid mbaqanga and Zulu-rock genres add a distinctly African pulse. Up and coming young artists like the T.Y. Boys used their previous generation's mbaqanga (see Next Stop Soweto Volume 1) in a new and exciting way, adding punk and disco touches to a bassline swing that had become a staple for township music. A couple of Hammond organ driven tracks courtesy of Abafana Bama Soul and The Movers- a nod to legendary funk instrumentalists The Meters, no doubt- are hard not to love, and capture the unstoppable energy of numerous curfew breaking gigs. It was out of this melting pot of cultures that The Mahotella Queens, Hugh Masekela and Ladysmith Black Mambazo found success by crossing into Western styles, and it's a joy to hear the roots of their music in such a pure form. But despite the oppressive conditions those artists revealed to the world, there's little anger here. Next Stop Soweto Volume 4 instead reflects a soul that was impossible to quash; as must have been transmitted to an uninformed Paul Simon, this is more of a whoop of pride than a political stand.